All the candidates who participated in PGIMER MD/MS exam on 25th November & were eagerly waiting for the result must pay attention. 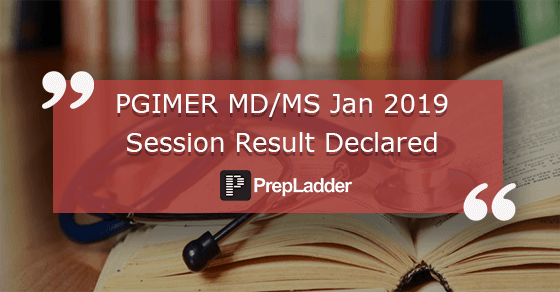 PGI Chandigarh has declared the result of PGIMER 2019 for MD/MS admissions for January 2019 session. The result has been declared in the form of PDF. It contains the name, category, percentage, overall rank and category rank of the candidate. All those who could not qualify PGI MD/MS January 2019 session, don’t get disheartened, gear up for upcoming exams. “Failure is the key to success; each mistake teaches us something"